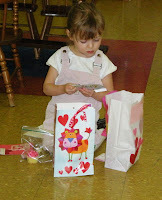 Today was our Valentine card exchange day. We always call it our party day, although it's not a huge party. It is enough for me though. I am exhausted. "Party" days always wear me out. 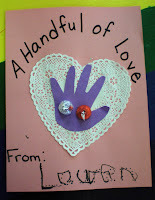 Our craft today was a Valentine card for Mom and Dad. There was not a lot for the children to do. I like to send something like this home to Mom and Dad to showcase how well they have gotten writing their names. 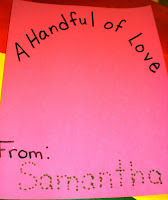 I had run some pink construction paper through the copier to have all the pieces of paper say: A Handful of Love, From. 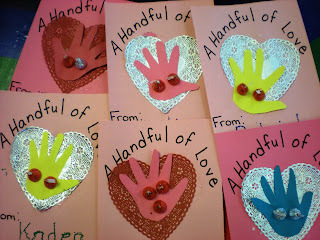 I called the children back and asked what color hands they wanted on their cards. We traced the hand, I cut the hand out while the children wrote their names. Some wanted to write their names by themselves, some wanted me to make dots first. 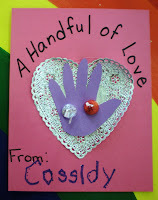 The next step was to glue a heart doilie in the middle of the page, the hand shape in the heart doilie, and 2 Hershey Kisses in the hand. Easy, but adorable. 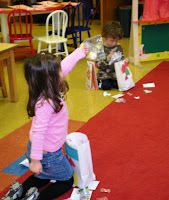 During free time the children got to be "mail carriers." 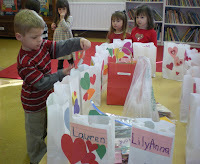 The Valentine bags were set out on the table and the children delivered their cards to their friends. This can take a while. 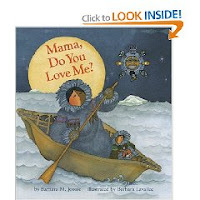 The book we read today was "Mama, Do You Love Me?," by Barbara Joosse, illustrated by Barbara Lavallee. This is a cute story of a little girl giving her mom all kinds of situations and asking her is she would still love her. The children were pretty mesmerized by it. We then played what I call the Friendship Game. I had made 7 hearts of different colors, then cut them in half. I "sprinkled" the half hearts on the floor. 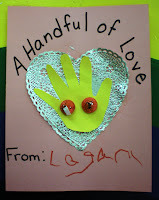 Each child got one piece of heart, then they had to find their "friend" to make a full heart. This is fun. 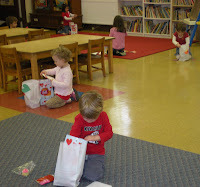 Finally, the children all got their Valentine bags and rummaged through them in wonderment as they opened all the cards from their friends. When we do this, I place their bags around the room and they have to go find their names. It helps to do it this way too, so they that they are not too close together and get all their cards mixed up. We made it. Valentine's Day at school is officially over. Off to President's Day. Aww! What a great day, even though exhausting I'm sure! I love the story selection- I never read that- new one for me to check out. Also, what a cute idea with the hearts. Have a good weekend and get some well deserved rest! Oh, yes, I know that exhaustion! How brave of you to let them open their Valentines! I have them wait until they can do so with their parents at home. Maybe one day I'll be brave enough, but not now!